There will still be a mismatch if the user changes their font setting, but at least the defaults would match. Fixing the rest would require cooperation from GNOME which is unlikely to happen since all this code is deprecated under Wayland. Gtk+3 has no concept of an xsetting for monospace font name. All Gtk+3 software which supports this concept finds the default by looking directly at the GNOME gsettings key. Including xfce4-terminal. This means none of that software pays any attention to Xfce's default. Including xfce4-terminal. In addition, some apps seem to directly query gsettings to find the proportional font too, and some will even mix up xsettings and gsettings. An example of this is pidgin, where all bold text uses the font defined in gsettings, and all non-bold text uses the font defined in xsettings. xubuntu-default-settings supplies default values for the distribution. It sets some of the GNOME gsettings keys to appropriate default values. For example it sets theme-name to Greybird and icon-theme to elementary-xfce. However it does not set defaults for the fonts. Proportional font defaults to Cantrell 11 and monospace is Monospace 11. Xfce appearance setting sets the Xfconf keys of course. But it does not touch any of GNOME's gsettings keys. So if you change your theme for example, the GNOME gsettings key will remain at the default set by xubuntu-default-settings ie Greybird. The setting is now wrong for both Xfce and GNOME. Unfortunately the only correct fix for this is to persuade Gtk developers to adopt an xsetting for the monospace font, and anything else that is missing. This is extremely unlikely to happen as they are trying to remove as many cross-desktop features as possible. Also Gtk+3 is in maintenance mode so it wouldn't be available until we port Xfce to Gtk+4 at the earliest. The only other alternative that will work is to make Xfce appearance settings capable of writing to gsettings, and mirroring all the appearance settings there. This is a horrible solution because those settings are supposed to be private to GNOME, and because appearance settings will need two different settings backends. The one thing we CAN do is patch all Xfce apps to use Xfconf to read this setting. All GNOME apps and cross-desktop apps like Terminator will continue to use the wrong fonts unless the user install dconf-editor or gnome-tweak. Screenshot attached. Desktop is Xfce. 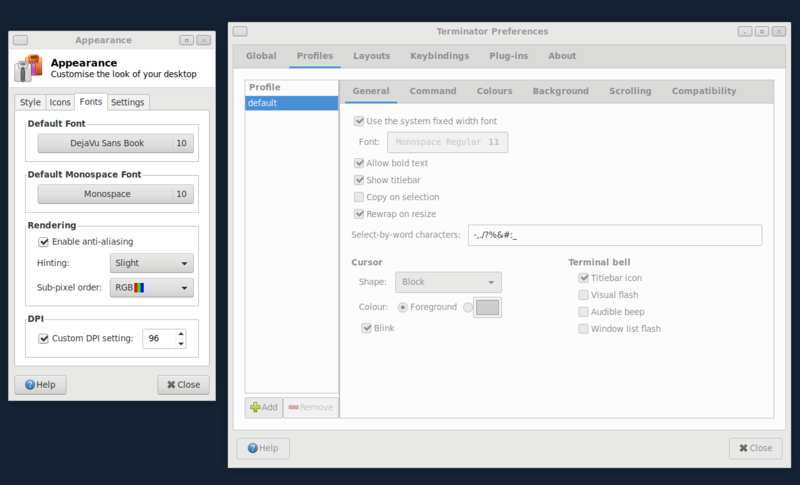 I'm pretty sure that you are tripping over the fact that terminator is gtk3 and checks in the gnome standard location. I'm not sure if xfce attempts to set the right fonts for the various desktops (i.e. gnome gtk2 and gtk3, kde, etc). I would argue that it is better to have the desktop set these values, rather than have every application trying to detect every desktop and parse their various ways of setting default fonts. I agree. Can you tell me where Gtk3 sets those standards, so that I can check? dconf command has no output for that. I assume because the value is set to the default. dconf-editor does show it though, and after I changed it to match the rest of the desktop, dconfcli shows it too. This makes Terminator show the right font. I have added xfce4-settings because Xfce Appearance settings should set this key if the user changes font, and xubuntu-default-settings because the default doesn't match the Xubuntu default. The same applies to /org/gnome/desktop/interface/font-name which is set to Cantrell by default in Xubuntu. By default in Xubuntu this is set to Greybird which is correct as the default. But changing the theme in Appearance does not change this key. So it is my understanding that Terminator should look at xsettings rather than going directly to gsettings/dconf over DBus, since gsettings may not even be in use at all. The GDK_DEBUG variable shows that the correct xsettings fonts are being passed to Terminator, it just ignores them. Those are only querying gsettings exactly the same as we are. If there was an easy way to query xsettings then I suppose it could be added as a fallback but, so far as I can tell, there is no commonly used/accepted python module for querying xsettings. Gdk-Message: 23:32:18.664: Gtk/MonospaceFontName = "Monospace 9.5"
Should this be added to xubuntu-default-settings.gsettings-override to match the Xfce font settings? Patch applied with the below commit. Terminal uses dconf org.gnome.desktop.interface.monospace-font-name font rather than xsettings one. Added support for xsettings, thanks!